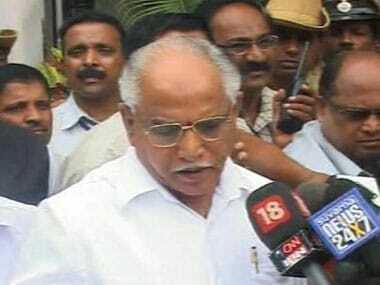 Last week's incident of Karnataka BJP chief BS Yeddyurappa having breakfast and lunch in Dalit party workers’ homes during their ongoing month-long tour of the state to gauge the severity of the drought, gave the Congress an opportunity, however meagre to criticise the BJP. They have dubbed the party "anti-Dalit" as Yeddyurappa had food brought from a hotel instead of lunch prepared by the Dalit worker’s family at Tumkur. Since the tour began last week, BJP leaders have made it a point to have breakfast and lunch in the homes of BJP Dalit workers in the respective towns and villages they visit, obviously with an intention of garnering Dalit support. Yeddyurappa, in Tumkur, reportedly rejected the pulao cooked by the Dalit worker’s family and partook of idlis and vadas brought from a hotel. The video clippings of this episode went viral when local Kannada channels telecast it. Congress leaders who were taken aback by the BJP’s sudden visits to Dalit homes, smelt politics in it and started attacking the BJP and its leaders. Congress party leader in Lok Sabha Mallikarjun Kharge led the verbal attack against BJP leaders on the issue, stating that Yeddyurappa and the BJP had insulted the oppressed classes. Kharge invoked the name of 12th century saint philosopher Basavanna. “By refusing to eat food cooked by a Dalit, Yeddyurappa has insulted the great philosopher Basavanna who, 800 years ago, conducted the marriage of a Brahmin boy with a Dalit girl,” he said. Rajya Sabha member and former All India Congress Committee general secretary BK Hariprasad said the Congress would not allow the BJP to ward off the black mark on it. "People know Saharanpur and Una killings where Dalits were lynched by upper caste people and who ruled these states. We are going to tell people in the elections about all these incidents against Dalits," Hariprasad said claiming that this would be one of the major issues in the 2018 elections. Even Janata Dal (Secular) leader HD Kumaraswamy did not lag behind in this war of words and taunted Yeddyurappa on this score. However, the BJP defended its leader and took on the Congress fiercely. "Congress leaders seem to be unaware of the facts related to this issue. When a leader visits a house of a BJP worker, hundreds follow him and in this case also, more than a hundred workers accompanied Yeddyurappa,” said state party spokesperson and former minister S Sureshkumar. “Naturally the poor Dalit BJP worker who hosted breakfast for Yeddyurappa was unable to serve the food to all and arranged for food from a nearby hotel. I think Congress leaders have not come across such situations as they seldom visit Dalits’ or poor people’s houses in Karnataka,” he said. BJP leaders including Sureshkumar termed the criticism of Congress leaders as a “panic reaction” to the Congress party’s declining support base amongst Dalits in the state. “Nobody can stop the BJP juggernaut under Yeddyurappa’s leadership from winning power in Karnataka,” Sureshkumar said. In the absence of a mass leader within the Congress, the party appears to be worried about the Lingayat strongman Yeddyurappa’s popularity in the community rather than how big the issue is or how it relates to the people. What has left the Congress leaders peeved is BJP’s efforts to woo Dalits who form the traditional vote bank of the Congress. Congress as a party and its leaders are well aware of the fact that any dent by the BJP into their Dalit support base will harm the party’s poll prospects in next year’s Assembly elections. They feel the BJP may run away with the majority of the Assembly seats reserved for Scheduled Caste and Scheduled Tribe groups. In the 2008 Assembly elections when the BJP emerged as the single largest party in Karnataka by winning 110 seats of the 224 Assembly seats (only three short to cross the halfway mark), BJP candidates scored in the majority of the seats reserved for SCs and STs. In 2008, more than ideology and principle, simple arithmetic worked for the BJP. In its gamble to win more seats reserved for SC and ST, the BJP fielded candidates belonging to what politicians call “touchable” Scheduled Caste groups such as Lambani and Bovi. In some segments, candidates belonging to Yedagai (“left-hand sect” of Dalits among the untouchables) who are known for their sober outlook, wooed voters of other communities and upper caste groups, including Lingayats. The “upper castes” too supported the party and voted for the SC candidates. This experiment worked out well for the BJP and its candidates not only won 36 of the 51 seats reserved for SC and ST groups, it also helped the BJP to make inroads into the traditional vote bank of the Congress in other constituencies by sending a subtle message across to the people that they are in favour of all Dalit sects and groups unlike the Congress which only encourages the “Balagai” (“right-hand sect” of Dalits among the untouchables). However, as the battle for power in 2018 begins, pulao takes centrestage over policy and governance of political parties. Though the victory of Congress candidates from Nanjangud and Gundlupet Assembly seats last month has boosted the morale of party leaders to an extent, internal discontent and the alleged autocratic behaviour of Siddaramaiah continues to top the mind. Congress leaders themselves say that victory in the by-elections will not be a yardstick to gauge the people’s mood in the 2018 Assembly elections. In this scenario, the battle can only get more bitter and murkier as the months fly by.